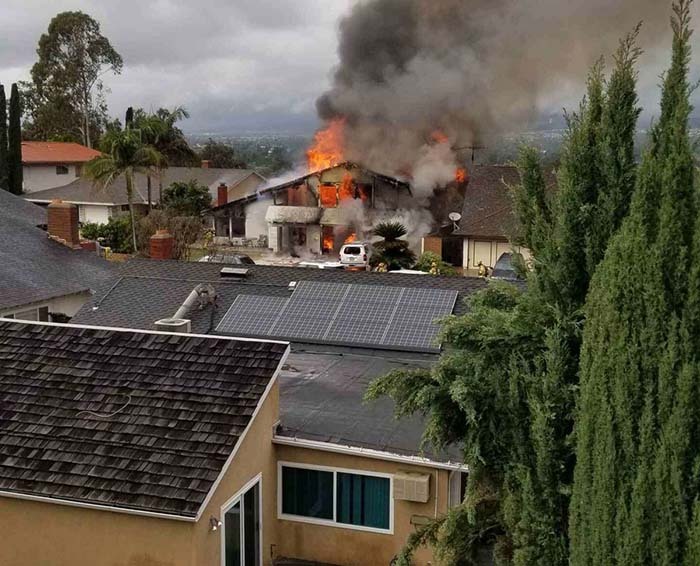 Five people died and two others were injured when a small plane apparently came apart, raining debris across a Southern California neighbourhood and igniting a house fire before landing in a backyard, authorities said on Sunday, 3 February 2019. 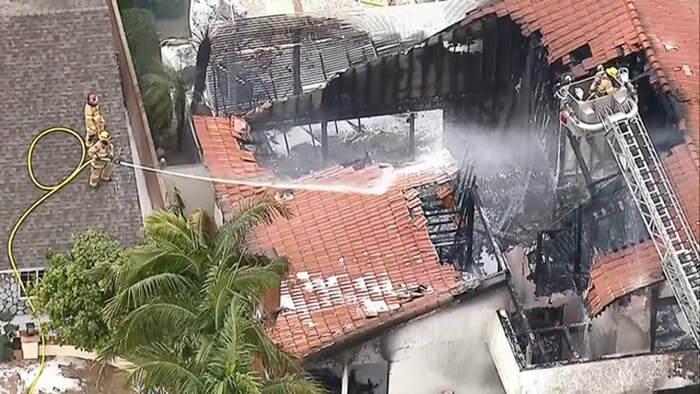 The male pilot, who was the only person in the twin-engine plane and four people in the Yorba Linda house that caught fire died on Sunday, Orange County Sheriff's Lieutenant, Cory Martino, said at a news conference on Sunday night. 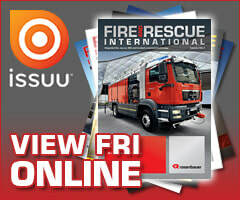 He said the deceased occupants of the home were two males and two females. No other identifying information such as names or ages was immediately released. Yorba Linda is 34 miles southeast of Los Angeles. 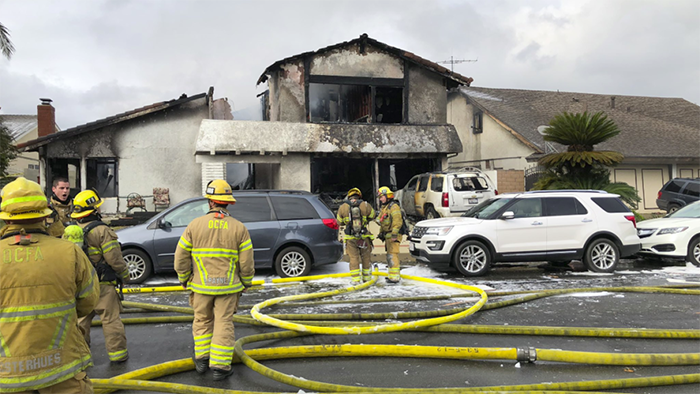 The Cessna 414A took off from the Fullerton Municipal Airport about a dozen miles west of the blaze, Federal Aviation Administration spokesman Allen Kenitzer said. 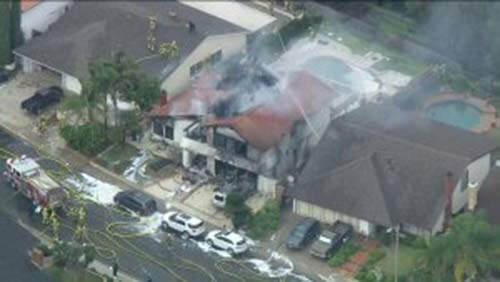 A two-storey house burst into flames after being struck by the main cabin and one engine of the plane, sending panicked neighbours into the streets. The second engine dislodged and fell onto the street, creating a large hole in the asphalt, according to Eliott Simpson, an aviation accident investigator with the National Transportation Safety Board (NTSB). 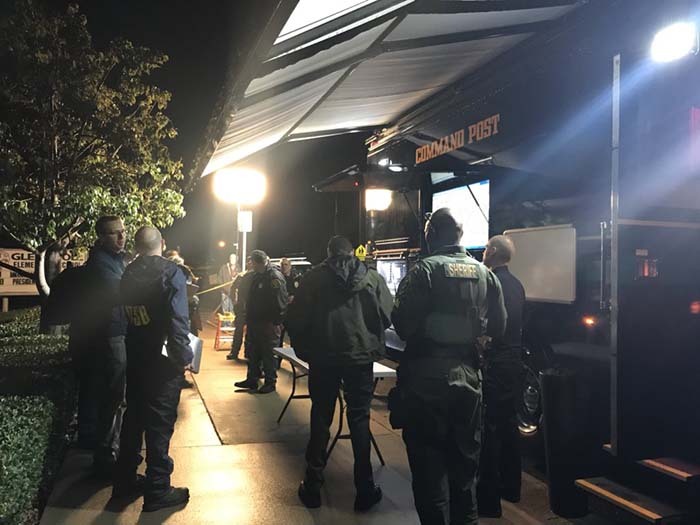 The wounded were taken to a hospital with burn injuries, said Pokey Sanchez, an assistant chief with the Orange County Fire Authority. A fire fighter was also treated for a minor injury. 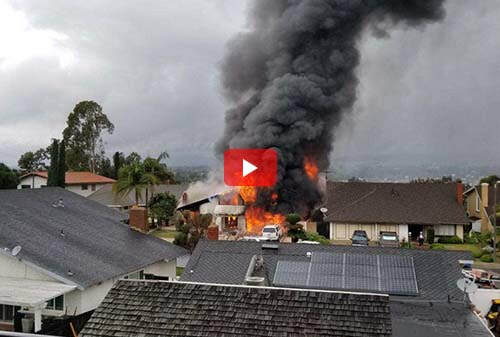 Video posted on Twitter showed panicked residents running to the house as it became engulfed in flames and dark smoke. One man doused a burning wing that landed on the street with a garden hose. 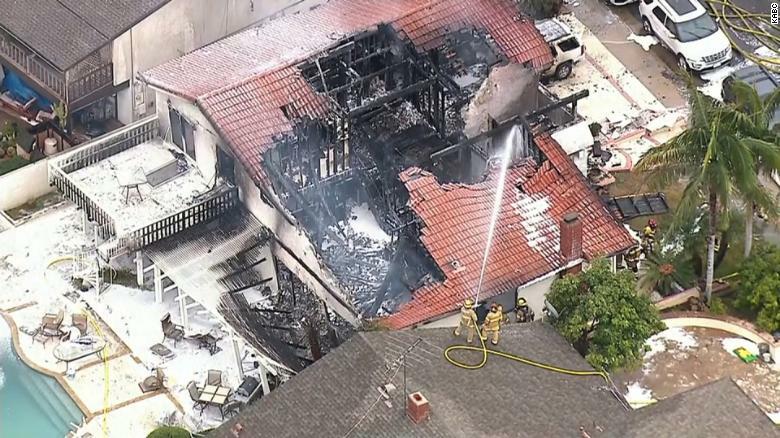 Aerial footage taken from news helicopters show plane parts, including side panels and a propeller, scattered on rooftops and driveways near the burned house. 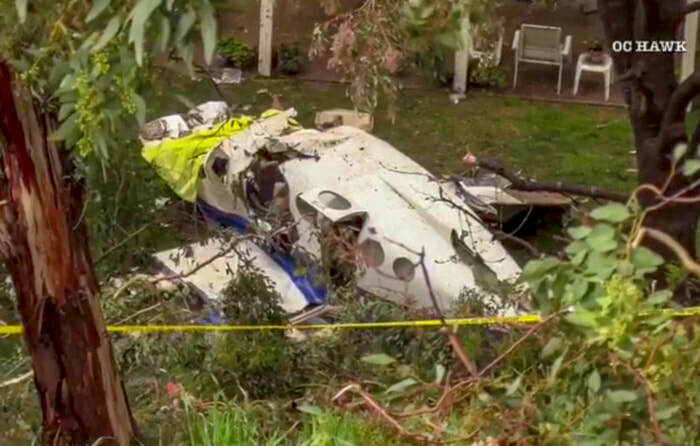 The main body of the twin-engine plane was found in the backyard of another home not far from the burned house. The fire spread to a SUV that was parked in the driveway. Debris was scattered over four blocks, Simpson said. "It was a boom, pop. I run outside thinking somebody hit my daughter's car," witness Laurie Stockstill said. "I look up. I see this huge piece. I don't know what it was. You can just watch it in slow motion. Then I see a big cloud of smoke go up. Oh my God, it was just awful. 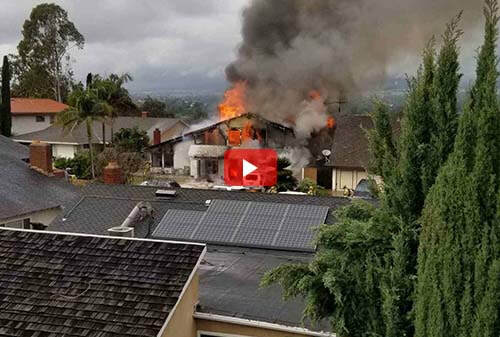 By the time I got from here to my backyard, the house was just burning." Clint Langford, who lives about a half-mile away, said he was in his living room when he heard a low rumbling. "It's the eerie, low rumbling sound that keeps getting lower and louder. It was scary," he said. "And then all of a sudden boom. It shook the house." 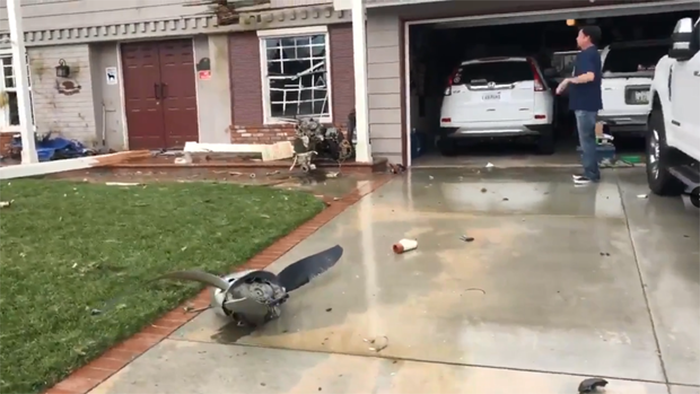 He looked out his front door and could see plane parts falling out the sky in the distance. Pat Rogers, who lives about a mile from the crash site, said he saw the plane on fire and coming apart. 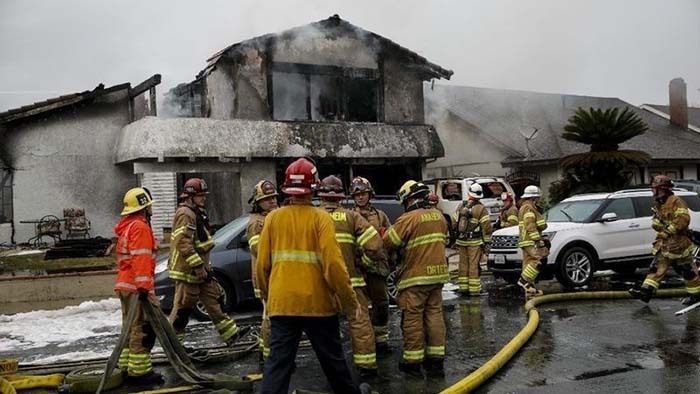 Rain from a winter storm helped fire fighters extinguish the house fire. They planned to search the burned house in case there were additional victims, Sanchez said. The Orange County Register reported the Cessna was built in 1981 and flown by a 75-year-old private pilot who had bought the aircraft last year. Weather at the time was overcast with rain and westerly winds about 7 knots. 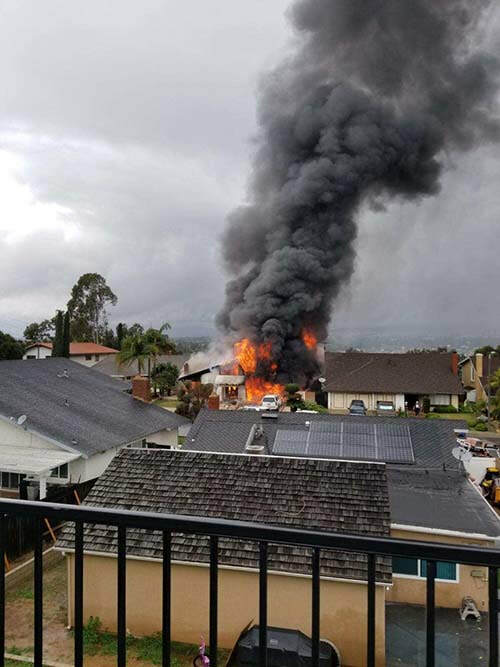 Reports speak of one engine striking the house, the second engine landing on a road and the fuselage coming to rest in the yard of another house. News footage shows part of a wing on a roadway. The Cessna 400 series of light piston twins, which were made from 1962–1987 was the subject of an unusually stringent AD last year. US Federal Aviation Administration AD 2018-03-03 requires repeated inspections of the left and the right forward lower carry-through spar cap for cracks and replacing the carry-through spar if cracks are found. Inspections were to be carried out within 25 flying hours for some 400 series models, or within 50 hours for others. 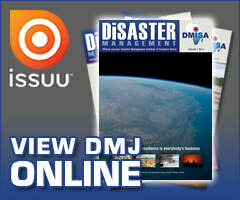 For low-hours aircraft in the 400-series inspections are required before 15 000 hours.